Psychology Phd Student Hannah Bowers has kindly shared her experience of using Reddit for research. I initially used reddit to recruit people with IBS for an online questionnaire about emotion processing and had a really positive response. I ended up with over 280 respondents, at least 93 of which were from reddit. I found posting on the ibs ‘subreddit’ the most successful, despite it being a quieter subreddit. Popular pages like r/health and r/samplesize tend to get a lot of posts, which means yours can get buried. r/ibs however has relatively few posts, yet still an audience of around 1,800. This means whenever you post, it jumps straight to the top of the page and into every subscribers ‘front page’. This combined with the very specific target audience, is why I think it was so successful. Using reddit meant users could comment on my recruitment post, and I could see positive and negative reactions to my research, both of which gave me a really great insight into why people were or weren’t taking part. When recruiting, many redditors asked for me to share my results. When I did, this was met with a few people who felt my findings perpetuated the idea that IBS is ‘all in the head’, despite my efforts to make it clear this isn’t what I was suggesting. This really helped me as a researcher to understand the kind of stigma people with IBS face and it allowed me to open up a dialogue, which then informed how I disseminated my findings to other populations with IBS. 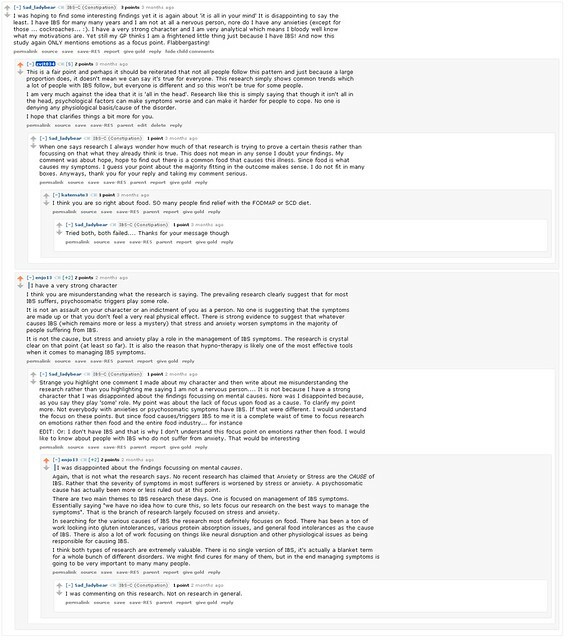 Overall my experience with reddit has been great, and I would recommend it to all researchers (so long as you have a thick skin).